The Seventh Judicial District Commission on Judicial Performance, by a unanimous vote (with one member absent and one vacancy), recommends Judge Ben A. Morris BE RETAINED. Judge Morris received an undergraduate degree from the University of Cincinnati with honors. He received his law degree from the University Of Idaho School Of Law in 2001. Judge Morris was appointed to the Montrose County Court bench in August, 2012 by Gov. John Hickenlooper. Judge Morris previously worked for the City of Montrose where he was the Senior Assistant City Attorney. 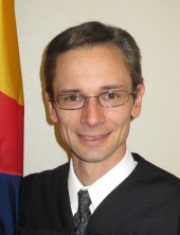 Judge Morris is the chair of the Seventh Judicial District Security Committee and has participated in ongoing training with the State of Colorado’s Judicial Training Programs. The Commission observed Judge Morris in the courtroom, reviewed the survey results, conducted a personal interview, interviewed the Chief Judge, the District Attorney and the Public Defender and reviewed Judge Morris’ written self-evaluation. Both attorneys and non-attorneys were surveyed regarding Judge Morris’s performance. Of attorneys responding to the survey, 62% recommended to retain, 19% not to retain, and 19% made no recommendation regarding retention. Of the non-attorneys responding to the survey 83% recommended to retain, 13% not to retain, and 4% made no recommendation regarding retention. However, given the small number of responses from both groups, the survey results may not be significant. Judge Morris’ workload is comprised with a majority of criminal cases and a small percentage of civil cases. Judge Morris presides over the largest docket in the 7th Judicial District. The commission noted Judge Morris was highly organized, held an exceptionally thorough first appearance advisement docket and has responded appropriately to the needs of the community. Overall, the commission voted unanimously he be retained.